Okay, I wanted to share my WIP on my devastator squad. I wanted to utilize all the weapon configurations in the sqaud box. This also allows the same configuration to be used in a tactical squad. 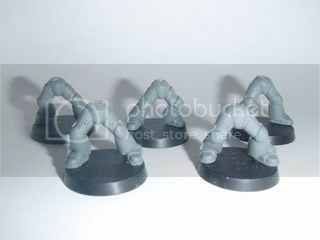 Therefore, my solution was to magnetize the legs and torsos to be swiched and interchanged as needed. So, here is how I did it. First, assemble your torso and legs. Second, take your round file and make a starter hole on the top of the legs and underneath the torso. Next turn it arround so that you are using the base of your file and make the hole larger. It so happens the diameter of the base of my file and my magnets are the same size. Third, I dry fitted the magnet in the hole again using the base of the file to hold the magnet. Be very careful not the put the magnet in all the way in as you need to make sure the polarity of your magnets are in the correct position. Make sure the hole is deep enough so the magnet will be flush/flat with the surrounding surface. Fourth, take the legs, place a drop of super glue into the hole, and slide the magnet into the hole. Again, use the base of your file to push the magnet into the hole. Allow the glue to dry. Then, take another magnet and place it on top of the legs as shown below. 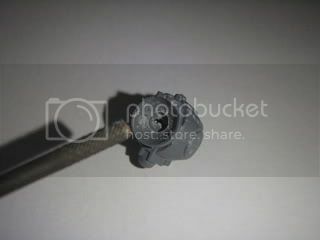 This will ensure the polarity is correct when you glue the torso magnet in place. 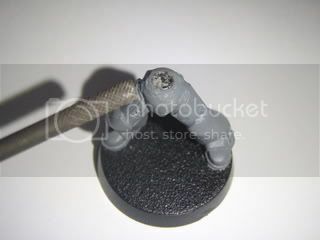 Take your torso and place a drop of super glue into the hole and push the torso and legs together. 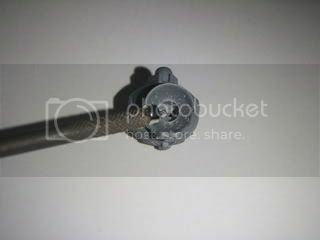 THIS IS VERY IMPORTANT, slide off the torso (do not pull as the magnet may come out) and again use the base of your file to push the magnet into the torso. Allow the glue to dry. Legs and torso should look as shown below. Fifth, assemble the torso and weapons. Notice that I used some bike squad torsos. If you do, additional work will be needed as the bottom of the bike squad torso is flat and the legs are rounded on the top. Now, you have multiple torsos you can interchange to customize your army as a Devastator Squad or as additional unit choices to add to your tactical squads. I hope that this tutorial will help anyone and everyone on customizing you army. There is more on customizing the sergeant and that tutorial will follow shortly. Now for part two, magnetizing your sergeant. 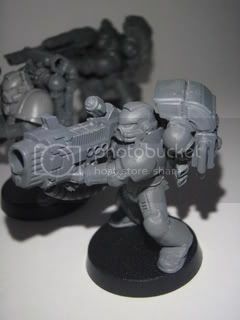 The whole procedure is the same as you can see in the photo below, my sergeant is using a powerfist and bolter. I am planning to assemble a torso with a plasma pistol. SO you may be asking why am I separating this from the rest of the squad? Well, you may have noticed that he does not have his backpack yet. Let's take a look at his back. Yes, the same magnet is a perfect fit. I snipped of the peg for the pack and made a hole using the base of my file again. It is very important that you keep your file centered because if you are a little off...well, you can see from the photo how small the gap is left on the side of the magnet. 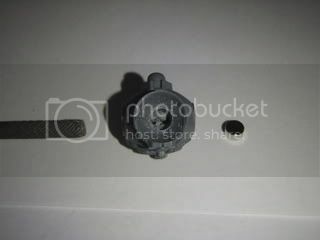 Now for the pack, the hole is the right size for the magnet but it needs to be flatened out so the magnet can fit flush as shown below. Again using the base of your file, flaten out the bottom of the hole. Be careful not to go too far as you might go through the entire pack. So the finished product is shown below. 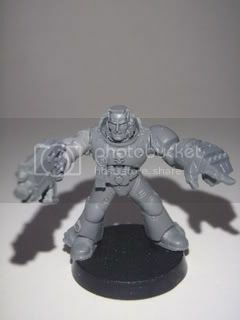 Now, he can be used as a sergeant or you can place another devastator torso on him to function as a tactical squad unit. The possibilities of options are only limited to the number of torsos you have on hand. 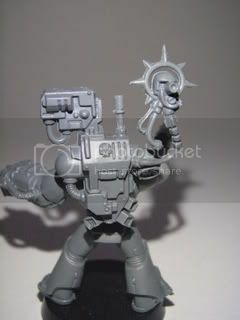 Why didn't you magnetize the arms and back pack? Thats what I did for my box, and now I can run what ever I want when I want to. 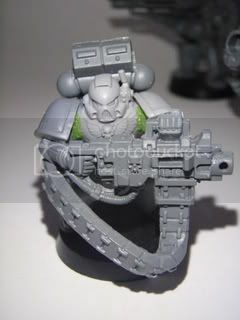 Yeah, I think magnetizing the sarge arms would probably be more useful. 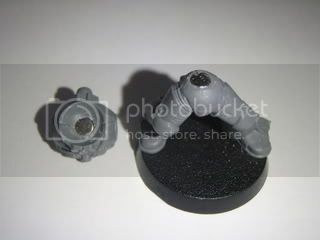 As to magnetized dev torsos, I am not sure of the utility there. Most people have plenty of marine bodies/legs. For a Devastator Squad, magnetizing the arms is a difficult option as you need all the pieces to line up properly (cables/pack). 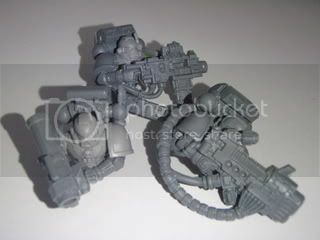 And my thoughts were transportation, if the arms were magnetized, the space between the arms would not be secure and there would be a high chance of breaking the parts when switching the weapon load outs or in transit (pinching). At least with the torso inbetween the arms there is more foundation/support. Also, you use less magnets doing the torsos only. Another thing is, all these magnets were left from my Land Raider Magnetization, so I had to use them somewhere. Here is the Squad with the Sergeant using the two different Packs. 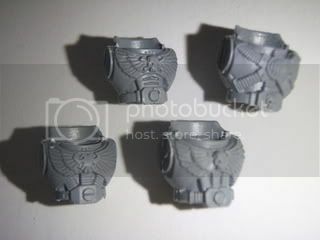 Eventually, I will get another assault squad and magnetize their Jump Pack to go on my tact squad torsos. I will echo the chorus of 'why bother'. As this is a tutorial and thus for peoples advice please dont get offended if we recommend to those reading NOT to do what you have offered here. 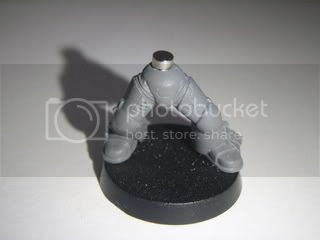 Say you made a magnetised sgt and multiple weapons options then instead for the cost of a few pairs of legs and bases you could have multiple marines. Same end result but you get less hassle and of course can use all the heavy weapons torsos at the same time for a 3x Dev squad army goodness. 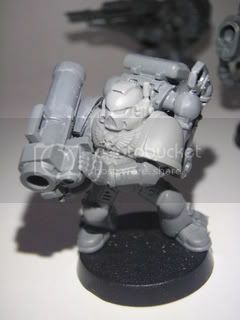 Furthermore GW boxsets dont include many extra torsos, so while you get extra weapons to use them you likely need to 'sacrifice' a bolter marine anyway. I would not even recommend to magnetise sergeants, you can simply afford to have spare. All in all a bad idea. Magnets are best used on the Commander boxset figure, so you can swap out weapons and banners. 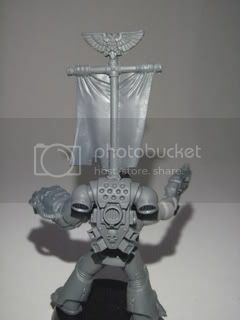 This is the most likely chopice for a custom, mini anyway and opne where you would want ther same person but with a choice of wargear. For this you need two to four maget points on the torso, the arms and optionally backpack and head. You will have the bits so nothing is lost and outfitting your commander right before the game just feels right. 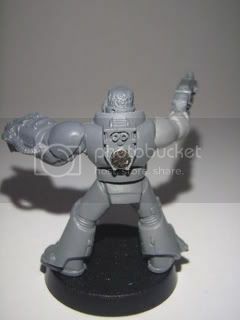 You can see him saying "hmm, I reckon I will have the plasma pistol and power sword today, or shall I go with lightning claws..."
Nice will see if I can do this at the end of the month am getting some minis to expand my Marine army. They dont call me Garybrandy for nothing! how is it off topic? we hardly know what the topic even is! Sometimes its fun to convert stuff, just because you can. I don't find devestator units too useful in games to start with, but the idea of big guns is too good to pass up. 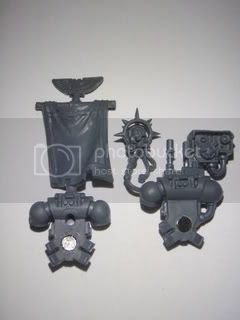 I'm going to magnetize mine as well, but instead of magnetizing the torsos or arms/weapons, I'm going to convert the backpacks to hold the heavy weapons, and just magnetize them. Swap out backpacks easily. 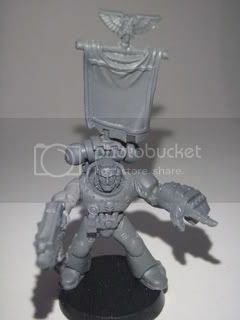 Additionally, the arms will still be holding the bolters (they don't lose them, do they? Far as I know they don't), so I can swap out normal backpacks and now I've got an extra tactical squad if I need it. 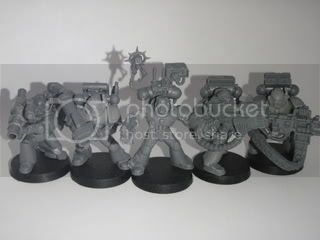 Im either gonna mag my new command models or select squads maybe one of my termies so as he can carry either a assault cannon or heavy flamer hmmmm. Well, out of one Devastator Kit, I was able to build two Devastator Squads. I honestly do not see myself using two squads, so, I will be using these torsos as a part of my Tact Squads by switching out the different weapon torsos and pay for the upgrades. 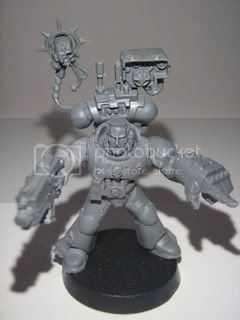 The purpose for the Backpack magnetization is really just to see if it would work as eventually, I will ultimately apply the concept to my Jump Pack Assault Squad where I can switch out the regular packs with a jump pack if needed. 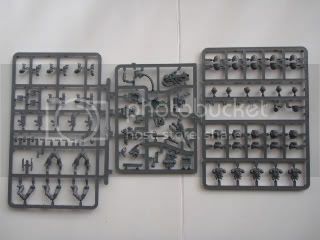 The assault squad box provided ample torsos (5 ea) as you get double the torsos in one box with only one set of legs. 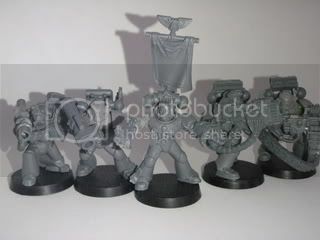 Not to mention the torsos I didn't use in my bike squad as I purchased two conversion packs (3 per box = 6 ea) for the white scars plus the commander coversion pack (1 ea). So, I have 12 spare torsos that did not have legs and each of those torsos had their own back pack. So, all that material and the spare time combined with a wild imagination, this is the result. The answer to your WHY...well, it's like asking me why I made my side doors hinged and operable on my land raider...and why I put a blinking light for the land raider interior...because I had the time and wild imagination.